Fire In South Korean Commercial Building Kills At Least 29 : The Two-Way "The fire engulfed an eight-story building and trapped dozens inside," NPR's Elise Hu reports from Seoul. "At least 15 of the dead were trapped in a second floor sauna." Firefighters make their way into a building on Dec. 21, 2017 in Jecheon, South Korea. The death toll jumped to 29 as rescue workers searched a scorched, smoke-filled commercial building in the southern city of Jecheon after a fire engulfed the building, firefighters said. 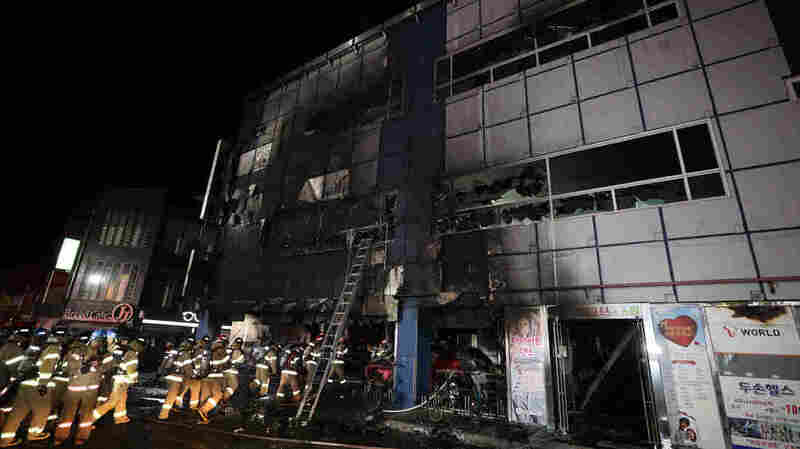 A fire in a large commercial building in central South Korea killed at least 29 people on Thursday, after flames raged through the structure that houses a sauna, a gym, and other recreational facilities. The blaze struck in Jecheon, in central South Korea. "The fire engulfed an eight-story building and trapped dozens inside," NPR's Elise Hu reports from Seoul. "At least 15 of the dead were trapped in a second floor sauna, fire officials told reporters on the scene. This single fire represents 10 percent of all fire deaths in South Korea annually." Local media report that the fire is believed to have started in the building's parking garage. Images from the scene show people scrambling on the rooftop to get into a crane's basket and be whisked to safety. And in a harrowing sequence, a man who had been clinging to a ledge was seen jumping from the building. According to multiple reports, he landed on an air cushion the firefighters had deployed. The Yonhap News Agency reports that around 20 people "were rescued from the rooftop where they were taking refuge from the fire." The agency adds that nearly 50 fire engines and trucks responded to the scene to fight the fire, along with two helicopters. The AP says, "Organizers for the Pyeongchang Winter Olympics said the Olympic torch relay had been scheduled to pass through Jecheon on Friday, but the route has been revised as a result of the tragedy."